"Artists from around the world pay tribute to video game culture on a Pixel Heart wood canvas." This is my piece for the "Pixel Hearts" show that's opening (or opened) on Friday, February 5th 2016. The show was curated by Chogrin for Gallery 1988 and was a blast to work on. I forgot how much fun these characters were to draw. The idea came to me while I was channel surfing and came across an airing of Indiana Jones and the Temple of Doom while sitting in a hotel in Vegas. I saw a picture of the Hindu god, Shiva, and the rest of it followed. It felt appropriate for a character who's known around the world. 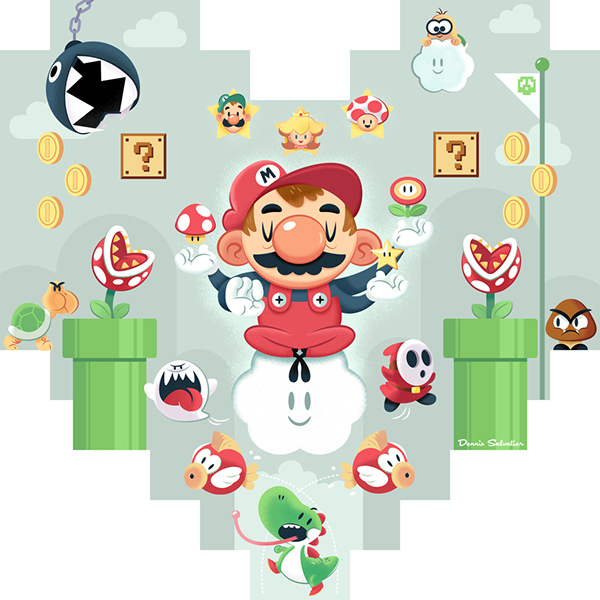 Super Mario piece for the Pixel Hearts show at Gallery 1988, curated by Chogrin.